An idea so straightforward you wonder why no one's thought of it before - no doubt the answer to some Elektron users' prayers! No tools required. Simple idea, excecuted well. Could do with rubber feet. Concerning itself with creating products to solve problems, E-RM Erfindungsbüro has done just that with the Brightside. "Installation requires no tools; all you need to do is screw in the studs"
Essentially it's two wooden side ends that are designed to fit the newer generation of Elektron boxes and raise them up in two different angles. 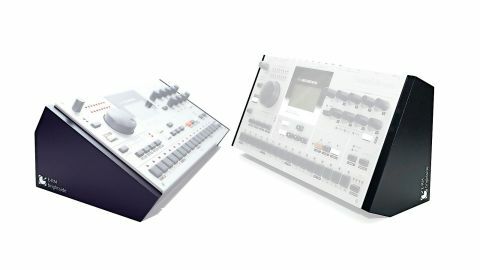 Compatible models are the Analog Four, Rytm, Octatrack, Monomachine MKII and Machinedrum MKII. Installation requires no tools; all you need to do is screw in the studs, slot on the wooden ends and you're done. One thing they could do with are some rubber feet to prevent slippage.